Yoga (/ˈjoʊɡə/; Sanskrit, योग Listen) is a group of physical, mental, and spiritual practices or disciplines which originated in ancient India. There is a broad variety of Yoga schools, practices, and goals in Hinduism, Buddhism, and Jainism. Among the most well-known types of yoga are Hatha yoga and Rāja yoga. The origins of yoga have been speculated to date back to pre-Vedic Indian traditions, it is mentioned in the Rigveda, but most likely developed around the sixth and fifth centuries BCE, in ancient India's ascetic and śramaṇa movements. 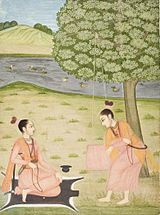 The chronology of earliest texts describing yoga-practices is unclear, varyingly credited to Hindu Upanishads and Buddhist Pāli Canon, probably of third century BCE or later. The Yoga Sutras of Patanjali date from the first half of the 1st millennium CE, but only gained prominence in the West in the 20th century. Hatha yoga texts emerged around the 11th century with origins in tantra. Many studies have tried to determine the effectiveness of yoga as a complementary intervention for cancer, schizophrenia, asthma, and heart disease. The results of these studies have been mixed and inconclusive, with cancer studies suggesting none to unclear effectiveness, and others suggesting yoga may reduce risk factors and aid in a patient's psychological healing process. On December 1, 2016, Yoga was listed as UNESCO’s Intangible cultural heritage.